Europe is facing its worst migrant crisis ever since World War II. Last year, over one million migrants crossed the treacherous waters of the Aegean and Mediterranean seas seeking a better life in Europe. They were escaping the war-torn regions of Syria and Africa. Unfortunately, many migrants are at the mercy of illegal traffickers who smuggle them into Europe. Besides endangering the lives of the fleeing migrants, the illegal activity has put an enormous strain on the countries where the migrants go to. After repeated requests from Germany, Turkey, and Greece, NATO (The North Atlantic Treaty Organization) announced that it will assist the European nations in dealing with the criminal networks and human traffickers. 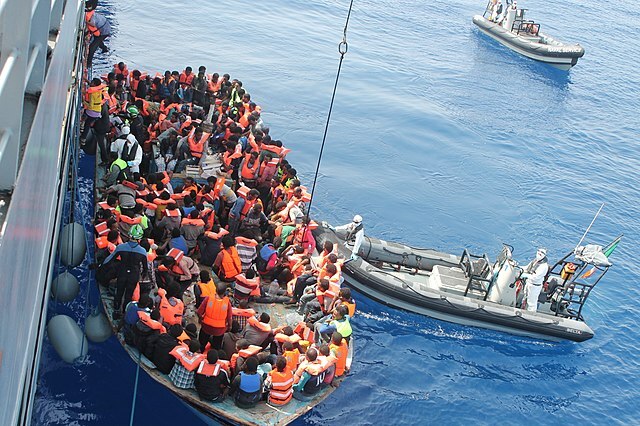 NATO will deploy ships to the Aegean sea in an effort to stop the human smuggling of migrants. This is the first intervention of its kind by the international security organization. Every year, thousands of people risk their lives to flee from conflict and instability in Africa and the Middle East. Most of these migrants land in Greece and Italy, from where they travel to Germany, France, Austria and other nations. Migrants entering Italy begin their boat ride from Libya and Tunisia but may also come from far-away areas such as Eritrea, Somalia, and South Sudan. Recently, however, the biggest refugee influx is from Syria. Nearly four million people (one-fifth of Syria's population) have left the country since civil war began in 2011. To make matters worse, the spread of ISIS terrorists in Iraq, Syria, and Afghanistan has further devastated the region and displaced more people. Many Syrian refugees settle in camps in neighboring countries like Turkey. But these camps are crowded and lack sufficient funding. Seeing little future for their families, the migrants begin their dangerous journey to Europe through Greece and Hungary. Read more here. What Does NATO Plan To Do? NATO's ships will provide information to Greek and Turkish coastguards to help them combat the migrant movement even before they begin the journey across the seas. If NATO warships spot boats with refugees in trouble, they will call for help from either Turkish or Greece coastguards who would intervene as necessary. The purpose of having an international agency like NATO patrolling the seas is so that the countries don't have issues such as crossing into another country's boundaries in the water. But why all this concern suddenly? The flood of refugees have increased in just the first month of 2016. According to the UN Refugee Agency, more than 75,000 migrants have already arrived in Greece by sea in 2016. Of these, over 45% are Syrians. It remains to be seen if these efforts will stop the inflow of refugees into Europe. There is also concern among world leaders about the impact this will have on the people who are caught and sent back without understanding the situations they are fleeing from.